This week’s card is called Birthday Card for step dad and was made by Littlepossum. 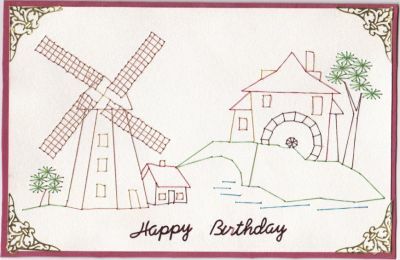 This attractive card was made using the windmill and waterwheel from the Form-A-Lines Country Scenes Set Patterns. Cards featured here must have been posted in either the Stitching Cards forum gallery or the Forum-A-Lines forum gallery. The card should be based on a Stitching Cards pattern or a Form-A-Lines pattern. This picture was posted in the Stitching Cards forum gallery. Would you like to enter your card as contender for “Forum gallery stitching card of the week”? All you have to do is post it in either Stitching Cards forum gallery or the Forum-A-Lines forum gallery. Forum membership is required to post pictures. Go to the forum and click the “Join” link to join.